I have a problem keeping my SC ASP sc71/75 running. I was told it was a 71 , but cannot find a reference to that on the internet. I can only find an SC 75.
t will run well for the best part of a tank, them it wont start. I have searched around and cannot find any tuning for the ASP SC 75. Just to let you know, I'm kind of new to nitro engines. BTW , your pages on the OS LA 46 have kept my Navaho flying superbly. I have heard that ASP engines are very similar to O.S. engines. Perhaps made by the same people, not quite sure. 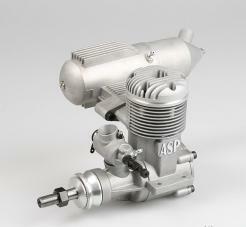 Here is some info on ASP engines You may be able to obtain a copy of the manual by contacting the folks that website. You should be able to get your issue straightened out even without a manual though. What exactly is it doing? Just all the sudden dying in the middle of a flight then won't start? How do you get it to start again after that. Just let it sit for a while? The pinch test works on all glow engines regardless of the brand. I recommend trying the pinch test on the high end to make sure you're not running your engine too rich, ... or too lean. G'day ASP, SC and Magnum are all made by the Sanye company in China not far from Hong Kong. They are copies of older OS (Japanese) designs but are not built to nearly the same quality. Mostly they run well but the odd one can be a total pain. They are ABn engines where n can be Chrome or Nickel. That is, the piston is Aluminium, the liner is Brass which is coated with either Chrome or Nickel. Chrome has gone out of favour for environmental reasons but it is actually the better coating. The liner is tapered so that at the top of the stroke, the piston "nips up" with the lines when the engine is cold. When the engine is hot, the liner expands away from the piston for a theoretical perfect fit. These engines are not fitted with piston rings and rely on the piston/liner fit for good compression. When they are hot, they can be harder to start because of the looser fit of the piston in the bore especially if the engine has started to wear. These engines must be run in at their normal running temperatures or you risk premature wear of the piston. For the first run, they should be run quite rich for about 30 seconds then leaned out to the point where they are just starting to run in a two stroke mode. At this point, I give the engine a couple of tanks running in this rich two stroke but every minute seconds or so, I lean the engine to a full two stroke for about 10 seconds and then back to the rich two stroke. Never run the engine really lean or you risk damage. I use fuel with some castor oil in it. For running in Sanye engines, quite a bit of castor is a good idea. I use at least 5% castor and a total of 20% oil. Some would say to use 25% castor for running in. Castor oil has greater lubricating properties if you go too lean than synthetic oil. After a couple of tanks on the ground to get to know the engine, I fly it but still at the rich two stroke and gradually lean it to full power over the next few flights. I always peak the engine then richen it so it slows by 300 to 500 revs even when fully run in. The mixture always leans out during a flight so you must start a little rich. To get the engine to idle well, it first needs to be run in. No engine will idle well when it is new. Most take about a half an hour's running to start to idle well. It sounds to me that you may be tuning the engine too lean on the high speed needle. Engines that are lean get hot and eventually stop. They are then hard to start. That's some very good information to know. Thank you very much for sharing. I bet a lot of folks will benefit from your post. What temperaturea are best for running my .46ax os engine.I usualy run it when the air temp is between 60 and 80 degrees.Will it hurt the engine if i run it when its cold outside,say 40 degrees. As long as you can get her started, the colder the better! IC engines are more efficient the colder it is. Some times we use our covering heat guns to get the engine warmed up so they will start when it's nearly zero F out side!